I like eggplant and have liked it for a long time, but I don’t think I really got what eggplant is all about until a few years ago. I used to saute it or roast it or puree the cooked flesh, and ya, it was good. But, eggplant can be better than just good. The wonders of eggplant have been best described by Nigel Slater in Tender Vol. 1. If only that book had been available back when I first started cooking eggplant, I would have had a better understanding of the vegetable from the beginning. I highly recommend it for anyone in need of vegetable understanding or inspiration. First, he uses the term aubergine for eggplant which is so much prettier sounding, and I wish it would take off here in the States. Then, he fondly mentions the different varieties and their shapes, sizes, and colors. He writes of the ivory ones: “their pale skins blushed with lilac or rose as if someone had taken an artist’s brush to them.” He goes on to poetically discuss cooking aubergines: “The aubergine is at its most sensuous in a haze of olive oil and garlic, onion and sultanas, pine kernels, yoghurt and fresh mint. The fragrance is beguiling, sumptuous, heady. The flesh of Solanum melongena loves the muskier spices such as cumin and saffron, the piercing sharpness of pomegranate seeds, the faintest breath of rosewater. But nothing does quite so much for it as being grilled over charcoal. Smoke seeps into the spongy flesh, lending a note of intrigue and exposing an altogether darker undertone.” Now, that’s what eggplant is about. When a nice, big aubergine appeared in our CSA box, it was most certainly going to be cooked over charcoal. There are eighteen recipes for aubergines in this section of the book, and every one of them sounds lovely. I was already determined to grill mine, and creamed feta sounded perfect with it. The aubergine was cut into thick slices which were sprinkled with salt and left to stand for up to an hour. Nigel does mention that salting isn’t really necessary to remove bitterness in the varieties of aubergine that are common these days, but salting does tighten up the surface of the cut pieces. After being salted, rinsed, and dried, the pieces absorb less oil. The slices were brushed with olive oil and then grilled for a few minutes per side until completely tender and just slightly charred in spots. The creamed feta was a mix of sheep’s yogurt, crumbled feta, and chopped parsley and mint. 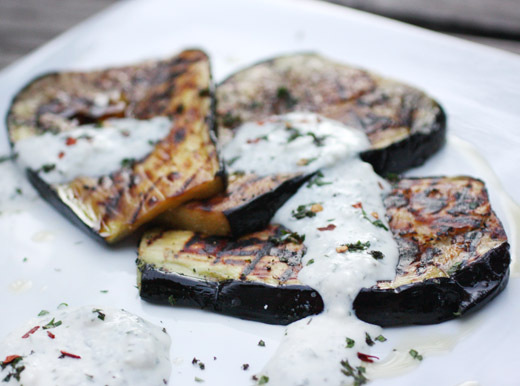 To serve, the grilled aubergine slices were drizzled with olive oil and topped with the creamed feta. I added a pinch or two of crushed red pepper for garnish. By grilling over high heat, the texture of the slices was barely crisp and charred from the grates on the surface and completely yielding inside. A little smoky flavor is indeed a fabulous quality in an aubergine dish, and it paired well with the herby, tangy, savory creamed feta. Now, I’m wondering if I really know all the other vegetables out there as well as I should. A delicious combination! Just the kind of vegetable dish I love. There is nothing I love more than a good eggplant dish. This looks so simple and delicious. Love the creamed feta on top! Nigel is a genius. I love just flipping through the Tender books and reading the introductions to the recipes. You've in spired me to go back and check out the aubergine recipes! (So with you- henceforth eggplant is banished). I like his books too... Grilling is by far my favorite way to enjoy aubergines, I never used a saucy feta like you did, and will definitely give it a try. Eggplant finds its way to our table with regularity, but I have never grilled it. Your photos are so intriguing, I will try this recipe soon. I just ordered Ripe and have yet to order Tender. With eighteen recipes for eggplant, I really need to place another Amazon order! I feel like I am at that stage of not knowing an eggplant's potential. I can't wait to try this recipe. Pinning it. i've never been into eggplant (i mean aubergine :)), but i suspect that is because i never really got to know its potential. i really need to give it another chance, this sounds lovely! What a great way to serve eggplant! And I love the way he writes about food. There's nothing like a great food writer to keep me reading. A delicious eggplant recipe. The creamed feta sauce sounds fabulous too. 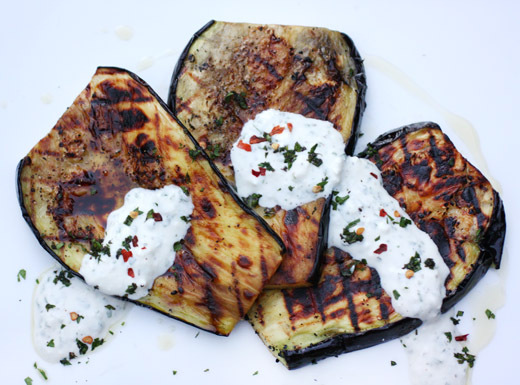 The savoriness of eggplant must be complimented wonderfully by the creamed feta. What a flavorful and attractive dish! I love to eat eggplants, but I am not too good at cooking it. Yours look just beautiful! Looks beautiful and so tasty the way that you prepared this eggplants...I often grill eggplants so the addition of this creamy feta on it will be just perfect. Lisa, such simple deliciousness. Eggplant always makes me happy and I'm a big fan of sheep's yogurt. I like that you combined the sheep yogurt and feta for the sauce. I love your blog! I am a fellow cookbook fanatic and love reading about and making new recipes. We are just discovering the joys of eggplant around here, as my husband has gotten into gardening in a big way the last few years. We were happy to realize a year or two ago how very much we loved eggplant in just about everything we've done with it. I posted about an eggplant spread I made yesterday, an Elizabeth David recipe, that was just superb. 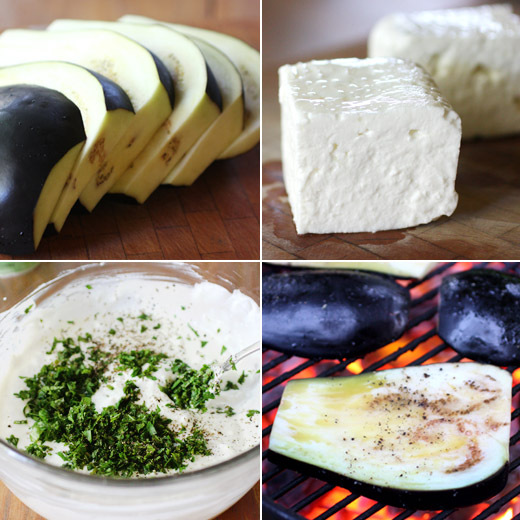 This grilled eggplant with the creamy feta looks amazing. Thank you for sharing! Grilled (or roasted) egg plants are terrific. But I've never tried it with feta before. Sounds like a terrific combo! I haven't read Slater, but it sounds as if I should. Thanks for the heads up. I am such a big fan of grilled aubergine, brushed with garlic oil and sprinkled with fresh mint and crumbly salted feta cheese. A winning combination every time. Your dish looks lovely Lisa. I completely agree with you re Nigel Slater - he is very poetic when he writes. A wonderful, unpretentious Turkish restaurant we love serves melt-in-the-mouth grilled eggplant with yogurt sauce and I am crazy about it! Yours looks divine! I am a recent convert when it comes to eggplant. I don't use it often in my cooking. These grilled eggplants looks perfect....and indeed do not look greasy at all!